Marijuana Business Daily reporter John Schroyer is on the ground in Berkeley, California, and will post live updates throughout New Year’s Day from the longest-operating medical cannabis dispensary in the country – Berkeley Patients Group (BPG). Also, check out Part I and Part II of our series on BPG’s transition from California’s unregulated marijuana market to a statewide regulated industry. The doors at BPG have officially closed for the night, and as they did, employees breathed a sigh of relief after a long day that began before 6 a.m.
“The numbers we saw earlier in the day remained consistent, and there was an uptick in the afternoon,” BPG’s director of government affairs, Sabrina Fendrick, said after the close of business. She was referring to a statement by BPG Chief Operating Officer Sean Luse just before noon that after 5 1/2 hours of sales the shop had completed almost 300 customer transactions and sold roughly $22,000 in product. That pace continued throughout the 16 hours that BPG was open for on New Year’s Day, Fendrick said. She declined to offer specifics on how many customer transactions took place but said over 1,200 drivers’ licenses were scanned from visitors who came through the front door. Not all of them made a purchase, she said. Fendrick said the traffic was “more than twice as busy as usual” compared to a typical Monday. With the 10 p.m. closing time approaching, BPG was still serving rec customers. About 20 were left in the shop as of 9:30, and 1,230 had come through the front door by 9:18 p.m.
One staffer said it’s safe to assume that most – but not all – of those visitors made a purchase. He said one of the more amusing developments he observed was groups showing up to pick up large orders that had been placed online, meaning that not everyone who visited BPG bought product. “One lady was saying, ‘I want to get something for my dad, I want to get something for my mom.’ I’ve never seen that before today,” the employee said, noting that it hadn’t been legally possible to buy for others before Jan. 1. BPG budtenders asked their own questions throughout the day, the dispensary’s Fendrick said, adding that the staff was flexible and customers were patient, so there weren’t any serious issues. For instance, some budtenders were unclear about specific regulations on edibles sales. Since rec customers are allowed to purchase only 100-milligram packages of infused products, several budtenders were unclear as to whether they were allowed to sell multiple 100-milligram packages to a single customer, Fendrick said. The confusion arose because medical patients can still buy more potent edibles with several hundred milligrams in a single package. Fendrick said California rules aren’t clear on that situation, but it wasn’t really a problem because she wasn’t aware of any customers who tried to buy excessive amounts of edibles. So BPG wasn’t forced to come up with an answer on Jan. 1, aside from allowing rec customers to purchase more than one 100-milligram edible in a single transaction. “That’s something I’m sure the final regulations will clarify,” Fendrick said, possibly later in the year. California has a cap of 1 ounce of flower and 8 grams of concentrate per day for each customer. Sales have gone “great” at BPG so far, Fendrick said. By 7 p.m., she was one of the few senior staff left onsite. She was bleary-eyed from the long day but smiling because of the success of it. Fendrick said that by 6:30 p.m., BPG had gotten at least 1,000 people through the door, though she could not offer specifics on the number of transactions. “Yeah. Very satisfied,” she said when asked if she was happy with how New Year’s Day turned out. The biggest surprise, she said, was how smoothly BPG’s first day of rec sales had gone and how few kinks there were. Even the disc jockey the retailer hired was still spinning tunes outside the shop just before 8 p.m., punctuating that the festive day was going like clockwork. “There was a lot of anticipation, because it’s California and it’s such a huge market,” Fendrick said. To try to lure customers back after New Year’s Day, BPG is offering membership discounts to anyone who signs up for the dispensary’s loyalty program. The approach is also being taken by other California retailers. In exchange for signing up with contact information, BPG customers will be emailed promo codes, notices of discounts and incentives such as a $5 in-store credit for every $100 spent, said Luse, the COO. There’ll even be the occasional buy-one-get-one-free promotion for members. But that’s not a strategy that 420 Central in Santa Ana is sold on yet. “We had one up until this year,” Rob Taft, who owns the Southern California dispensary, told MJBizDaily. He’s still entertaining the idea, he said, but has to figure out exactly what kind of offers he can use to attract customers. “The best you can do is do a sale … but we’re still trying to figure out how that will play out,” Taft said. BPG executive Luse said the company is holding steady on inventory, given how much it stocked up in December. And that’s only if not enough growers, edibles makers, concentrate producers and other MJ companies fail to get licensed. The entire supply chain will be a giant question mark in the early months of 2018 for retailers. “If there’s not a good supply chain in the second quarter (of 2018), things could get pretty ugly pretty quick,” Luse said. One of the steps 420 Central in Santa Ana took for California’s rec opening day was to have the company attorney on hand to answer questions about legal sales procedures. 420 Central owner Taft said the decision was made deliberately because of a December bust at Colorado retail cannabis chain Sweet Leaf, which had 26 licenses revoked stemming from charges that too much marijuana to customers. “Our budtenders are being coached by general counsel on the law,” he said. Taft said Sweet Leaf is the example he used when talking to his budtenders and other employees about the importance of strict compliance. The attorney is also coaching staff on how to ensure when product packaging is fully compliant before it’s sold so the company doesn’t commit any violations. Yet another California retailer is having an “unbelievable” New Year’s Day. 420 Central had served roughly 400 customers and sold nearly $30,000 in product by 1:30 p.m., Taft said. “We’ve had a line out the door since we opened, and it’s still outside the door,” he said just after 2 p.m.
“We’ve had mayors, we’ve had council, we’ve had politicians, and a lot of people coming from L.A. and San Diego and other states (like) Idaho and Tennessee,” Taft said, elatedly. The demand and pace of sales is also putting a slight strain on his inventory, Taft said. “We usually stock up once a week, so this week we might have to stock up twice,” Taft said. Among the items in top demand? Flower, vape pens and concentrates. Edibles aren’t as readily available, he said, because not many manufacturers were able to come into compliance before the new year. But that’s of little concern at the moment for Taft, who was obviously relishing the victory of Proposition 64 in 2016, which led to his “phenomenal” start to 2018. “Red and blue together makes green, and as soon as we stop dividing people, we can change anything,” he said enthusiastically. While BPG had a bit of a slow start to its New Year’s, the Caliva dispensary in San Jose was the opposite, said company president Dennis O’Malley. “The line started last night, and the first employee came in about 6:30 this morning and the line was about 100 people long,” O’Malley said. Caliva, which was one of the few California cannabis retailers to start rec sales on New Year’s Day, said the first day of 2018 is already surpassing his expectations. “We’ll do probably four to five times what an average day is for us. So this should be our busiest day in our history,” O’Malley said. He declined to offer an estimate on how many customers Caliva had served as of 1 p.m. Still, O’Malley was over the moon when MJBizDaily called to ask how New Year’s Day was going for the 2 1/2-year-old dispensary. “We didn’t anticipate it would be this many people,” O’Malley said. Despite the long lines, he added, customers have been happy to wait their turns. The shop has even had a few customers from as far away as Canada and Illinois, he said. However, O’Malley added, a “good mix” of Caliva’s customers are existing medical patients who already frequent the shop, meaning the dispensary may not be able to count on repeat business from all its New Year’s Day visitors. But the bottom line for O’Malley is simple. “It’s definitely exceeding expectations on the number of people and how patient everyone is,” he said. There was at least one hiccup with the new cannabis vending machine BPG has onsite. At one point, a customer making a purchase inserted a $20 bill, and the machine spat out seven $5 bills as change. “We immediately redid the transaction, and it went just fine. So I’m hoping it was just a fluke, but I have the service provider working on it right now” from a remote location, Luse said. In the meantime, the vending machine is still up and running for other customers and seems to be working fine, Luse said. “I’m taking my chances,” he said with a grin. BPG’s Luse loves it when a plan comes together. The dispensary’s COO said just after noon on New Year’s Day that things are still running smoothly, with very few hiccups at any point in the operational chain. And as of 11:30 a.m., he said, BPG had hit almost 300 customer transactions and roughly $22,000 in sales. That’s an average of just over $73 per purchase, which is where Luse was hoping to be at this point in the day. “Any semblance of this demand past today” would ensure a solid future for California’s rec MJ industry, Luse said. However, he reiterated that the question will be how many people will prove to be regular customers. As predicted, an increasing number of customers are flocking to Berkeley Patients Group as the day goes on. The line now stretches most of the way down the block and is over 100 feet long. Another California retailer has opened for business to the general public. 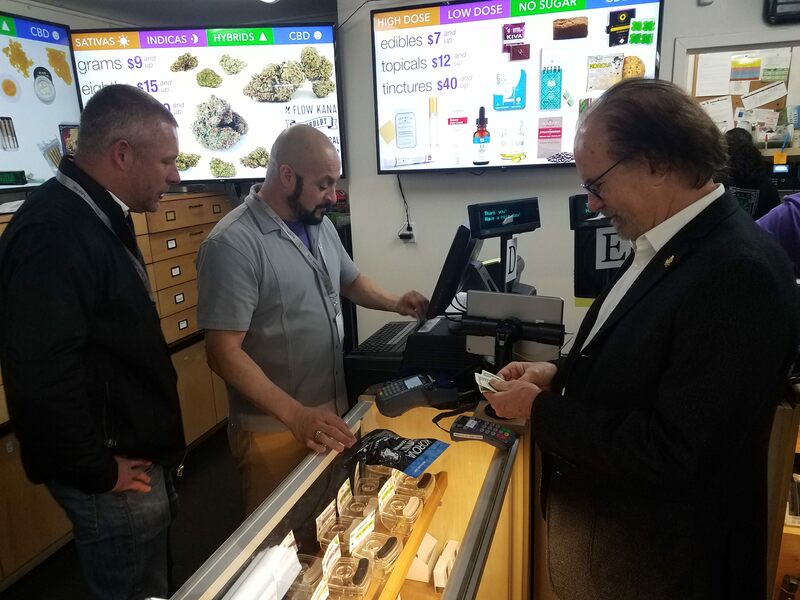 Sparc Sebastopol, about an hour north of San Francisco, began serving rec customers at 10:30 a.m.
Pearson called New Year’s Day a “milestone” and said he’s happy that California has caught up with other states that have functioning rec markets. He was spending the morning hanging outside in the sun with friends and colleagues, enjoying live music at the Sparc shop while the new industry gets underway. Pearson said it was too early for any significant feedback about customer purchases and business data, but he said he fully expects that the majority of customers will be for adult-use cannabis. But he has similar concerns to those of BPG co-owner Tim Schick: The tax rates will drive consumers to the black market. “I personally feel the taxes are not in the sweet spot. They’re a bit high,” Pearson said. “So we’ll see if people agree to come into the regulated system and pay those taxes. At the close of business on New Year’s Eve for the California Bureau of Cannabis Control, the agency had issued 404 temporary business licenses for marijuana companies, while hundreds more applications were still waiting to be processed. Though that’s likely a small fraction of the number of businesses that will eventually obtain permits to operate in the newly-regulated California market, it still represents arguably a solid start to the industry, given how many hurdles state and local officials (not to mention companies themselves) had to jump through over the course of 2017. It’s also worth noting that not all those licenses went to different companies. Many, including BPG, were awarded multiple permits (BPG applied for and was awarded adult-use and medical retail licenses, as well as a distributor permit). Just because there are 234 licensed retailers doesn’t mean all of them will be operational on Jan. 1. There’s also plenty of overlap on licensing, such as BPG’s two retail permits: one for rec and one for medical. Santa Cruz-based Kindpeoples, for instance, was granted eight temporary licenses, including for retail, distribution and microbusiness. So far, MJBizDaily does not have a full head count on exactly how many retailers will be open and doing business on Jan. 1, but the estimates from industry insiders are that as few as a couple dozen will be selling rec MJ legally on New Year’s Day. A few aside from BPG that are definitely beginning sales on New Year’s Day include Harborside and Magnolia Wellness in Oakland, Caliva in San Jose and 420 Central in Santa Ana. BPG’s customers on New Year’s cover a wide range of demographics, from elderly MMJ patients to 20-something millennials, as the crowd at the Berkeley retail shop continues to pick up as opening day wears on. Johnson said he spent about $30 on a few pre-rolled joints and some flower. Asked if he’ll be back, he grinned. Johnson, along with plenty of other customers, let his medical cannabis card from the state expire in anticipation he wouldn’t need it once rec sales began. And the tax rates that bother some customers didn’t even make him blink. “With all the taxes, I’d still do it,” Johnson said, joking that he might be back to BPG on a daily basis. Blanchard, who also let his medical card expire, is up in the air as to whether he’ll still be a regular customer. He also said he’ll have to consider whether the increased prices still make his trips to cannabis retailers worth it. “I don’t know. I’ll have to see,” he said. Meanwhile, the line outside BPG continued to grow. As of about 10:30 a.m., there were roughly 60 customers waiting to make a New Year’s Day purchase. Foot traffic at BPG has begun picking up as the morning wears on, with about 30 customers now in line to make purchases. Luse, the COO, estimated that so far the average purchase price is probably around $100, though he noted that was just from eyeballing what customers are buying. “That’s kind of what it looks like,” he added. Luse estimated that – with taxes – the average eighth for sale at BPG is about $63 out the door for customers buying a $50 eighth of flower. He noted plenty of people may be stocking up, or possibly buying cannabis as gifts, which is now legal under California’s rec law. Three and a half hours into the new recreational industry, Luse added, the biggest surprise is that there haven’t been any big surprises. He believes the reason could be that California is the sixth state to begin rec sales, after Colorado, Washington, Oregon, Alaska and Nevada (in chronological order), meaning that a good bit of the novelty has worn off for customers, especially in the western United States. “It’s not the first,” Luse said. One of the customers on New Year’s Day turned out to be the prominent San Francisco MJ attorney Henry Wykowski, who earlier in the morning had made the first purchase at Harborside in Oakland. He happily bought a Korova edible at BPG to add to his personal cannabis inventory. “This is more exciting than Election Night … I’ve been out all night. I think I got 40 minutes of sleep in the car.” –Lauren Vasquez, a former adviser on the Prop 64 campaign. “We do accept passports, yes.” – a BPG employee to a customer whose ID was requested. “I can use these for trimming weed at home!” – Mike Barnes, local cannabis enthusiast, jokingly holding up the giant ceremonial scissors used by the Berkeley mayor to cut the grand opening ribbon at 6 a.m. 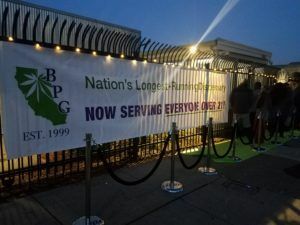 So far, the majority of BPG’s customers today have been first-time rec purchasers, and most, if not all, are local residents, one budtender said. Although the company doesn’t have any real analytics yet, that’s the general sense from those behind the counter, he said. “Not too many people with medical cards this time of the morning,” he said, noting that medical patients probably weren’t motivated to get out early on New Year’s Day. The best-selling items of the new year so far? Vape cartridges and eighths of flower. The budtender said he was a bit surprised that edibles haven’t moved as much yet, but he chalked that up to the type of customers the dispensary has gotten a lot of so far: New cannabis users who aren’t as familiar with different modes of consumption. The upside of a slow morning, added COO Luse, is that the operations side has been “fairly smooth,” with its new MJ Freeway system chugging along and the biggest road bump being customer unhappiness with tax-inflated prices. 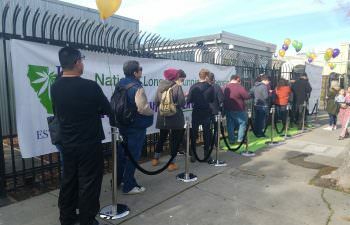 Just two hours after the first rec sale made at BPG, only 10 customers were left inside the dispensary, with no wait lines outside. Luse said he expects foot traffic to surge later in the day. At least one customer said early on New Year’s Day he believes high marijuana taxes in California will breathe new life into the state’s black market. “Medical marijuana killed the black market. This is bringing it back,” the customer said as he walked out of BPG. He said he purchased a gram of hash for $13, which he said used to cost him $10 as a medical cannabis card holder. “I almost didn’t even buy this,” he said. The customer, who asked to be identified only as Kamal, said he thinks the state is shooting itself in the foot with the high tax rates, and that simple cost will drive plenty of consumers to illegal dealers as opposed to tax-paying retail outlets like BPG. “It makes no sense,” he said, shaking his head. BPG co-owner Tim Schick said that his “biggest heartburn” is already coming from worrying about California cannabis tax rates potentially driving customers to the black market in search of lower prices. “Most of my anxiety has to do with sticker shock,” he said. When asked just before 7 a.m. if he had already encountered customers questioning the higher prices due to the new taxes that went into effect Jan. 1, he nodded. “It just happened. A guy was looking at his receipt and saying, ‘Where are all these taxes coming from? '” Schick said. But, he added, he’s optimistic that the Berkeley City Council will lower the local cannabis tax rate in the near future to avoid just that kind of disincentive for potential customers of legal MJ retailers. Schick also said he’s not sure how much of a boost in customer traffic BPG will see New Year’s Day. But, he added that, on average, the dispensary gets 400-700 people per day. Schick also said it’s difficult to predict how much BPG – and other Bay Area retailers – may see sales increase due to adult use. He said he thinks MJ businesses in Southern California are going to see more of a spike just because of the much-larger population base. As of 7 a.m., there were still several dozen customers lined up either in BPG or outside, but the shop wasn’t exactly mobbed. There were about 25 people outside and another 15 or so inside waiting to make purchases. The newly rolled out BPG vending machine had a few initial hiccups, but then quickly got working once employees started spreading the word to customers that the machine won’t take $100 or $50 bills. 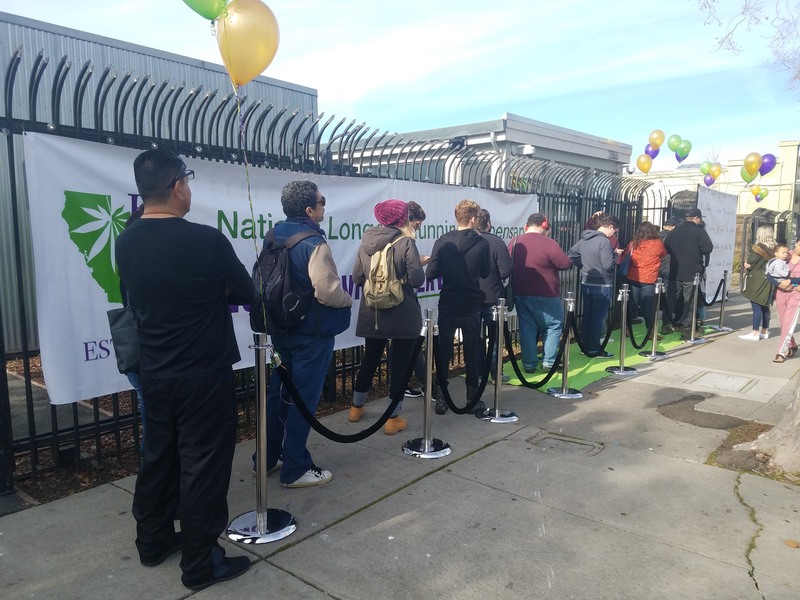 About 25 customers were lined up before 6 a.m. New Year’s Day in front of Berkeley Patients Group, the longest-operating medical cannabis dispensary in the United States, in anticipation of the retailer beginning full adult-use marijuana sales at the top of the hour. And BPG did not disappoint. 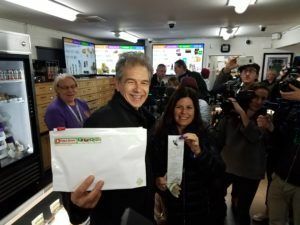 After a ceremonial ribbon-cutting with Mayor Jesse Arreguin, longtime MJ legalization activists and Bay Area residents Chris Conrad and his wife, Mikki Norris, made the first purchase. 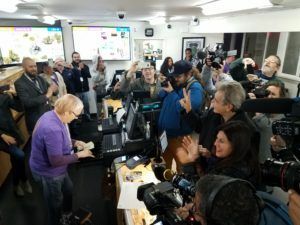 Employees jokingly counted down the seconds until 6 a.m., the earliest that state regulations allow for rec sales to start, and cheers erupted when the transaction was finalized. Conrad and Norris held up their exit bag and receipt for a gaggle of reporters and photographers who were on-hand for the historic moment. Conrad said he doesn’t think BPG will see a lot of traffic from other states or countries on the first day of legal sales. He believes the novelty of being involved in an MJ debut went out the door in 2014, when Colorado became the first U.S. state to launch full adult-use cannabis retail operations. “I think we will see some tourism, but it’s not going to be as big as if we’d just legalized in 2010 the way I’d hoped,” Conrad said, referring to a legalization ballot measure, Proposition 19, that failed that year. Proposition 64, which legalized recreational MJ, was passed by California voters in 2016. Conrad and Morris bought a few pre-rolled joints and a chocolate Kiva bar. 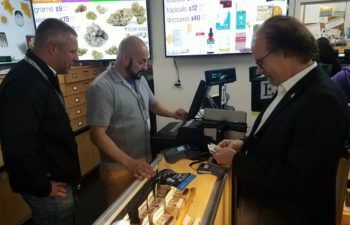 LaChance, the operations director, was working until the very last minute with employees to ensure they were familiar with how to properly ring up new customers, and how to change up the cashier system depending on if the customer was buying MMJ or rec. LaChance said he wished he’d had another two months for prep work, but added that he’s confident that the BPG’s newly installed MJ Freeway point-of-sale system will work and that the shop has plenty of inventory. “There’s always a tiny bit of anxiety … but I think we’ve done everything we could,” LaChance said. At 9:30 p.m., half an hour after Berkeley Patients Group closed for business, plenty of the dispensary’s employees were still hard at work, prepping for the big start of adult-use marijuana sales at 6 a.m. Monday. The roughly 10-15 employees still onsite were mostly doing inventory counts to ensure that their computer records matched the amount of product the retailer had on hand, said Raymond Owens, BPG’s facilities coordinator. BPG – along with the other few retailers lucky enough to get licenses to sell MJ on Jan. 1 – was going the extra mile to ensure it’s in compliance with all the necessary rules and regulations. That’s also going to include more last-minute training the morning of Jan. 1 for employees to ensure everyone is on the same page regarding sales procedures and other protocols for the first day of rec sales, Owens said. Dispensary employees also spent Sunday testing out and stocking a cannabis product vending machine that they hope will help expedite customer sales. The machine, which BPG is renting, is emblazoned with the company logo and carries a solid variety of products, ranging from pre-rolled joints to vape cartridges to edibles. Other preparations were also still being made as well. A long green carpet to be rolled out for customers. A banner with BPG’s logo and the hashtag “Weeddidit” that visitors will be able to take photos in front of before or after they make purchases. Fendrick even rounded up a bright green ribbon and oversized ceremonial scissors for the city’s mayor to cut the ribbon, a ceremony to be executed at 6 a.m. sharp, when the store will legally be allowed to open to the public. Most of the décor, however, was left until the wee hours of the morning, since about 30 employees will be showing up for their shifts between 4 a.m. and 5 a.m., Owens said. I want to learn HOW and WHERE to buy/purchase California Marijuana Penny Stocks. Can you please inform me? The Marijuana Business Daily is a very informative source and I’ve only been a subscriber for a week. I became interested in penny stocks about a year ago, I’ve had a trading account through Options Xpress (now it’s owned by Charles Schwab ) for many years and would recommend getting an account somewhere for access to investigate companies you come across, the best way to find out about more companies is through the news clips posted at the brokerage.. that’s where I found out about mjbizdaily.com ! I currently own 3 penny stocks I bought a year ago, one is struggling but the other two are doing well. Having the access to all the news is huge and the charts showing a company’s performance is the only way to go when picking any stock. Wow , looks like I’m on the wrong coast ! !